Only 10 minutes’ drive from Minori, Maiori was known as RhegginaMaior earlier. In close proximity to Minori, Maiori was also one of the favorite recreation destination among the Romans. Once an important hub for Amalfi when it was a maritime powerhouse, it has come a long way from an important trade hub to a charming quite resort town with various shops, bars, cafés and an occasional night market. Main areas to shop for local stuff or a gift/ souvenir would be CorsaReginna and Lungomareamendola. One of the most famous annual festival is Santa Maria – quite a crowd puller! 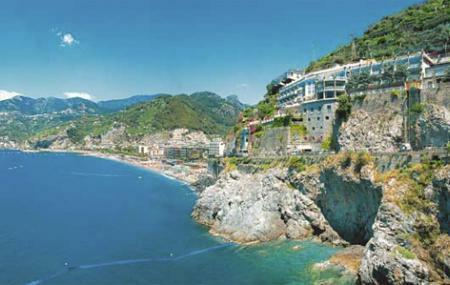 Explore this beautiful resort town on a day trip while at Amalfi. Best time to visit Maiori, like its neighbouring cities, is anytime during the year. Although the peak season is from June to August. Drive down or hop onto SITA Bus to get to the city. People normally club together Castello Di Arechi and Medieval Aqueduct while planning their visit to Maiori. People also prefer to end their day with Maiori.